From the Archive: Vertical Files Online! 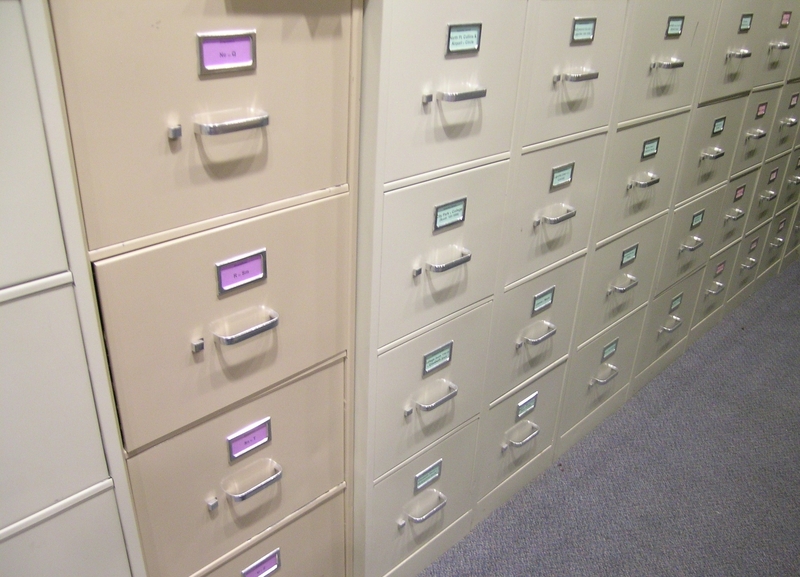 Did you know that one of the treasure troves in the Fort Collins Local History Archive is the collection of over 3,800 vertical files available to folks like you who are curious about local history? These many file folders have been assembled over a long period of time and are continually expanded by Archive staff and volunteers. They cover a wide range of topics and are some of the most requested items by researchers interested in local history. The Subject Files are handy packets of information containing newspaper clippings, student papers, government reports, and more. They are a great place to start researching local topics like the sugar beet industry or neighborhood schools. The Biographical Files contain clippings and reports on individuals and families from Fort Collins history. Some files include family histories created by researchers and donated to the Archive. The Ephemera Files are organized by subject and surnames and include fragile primary source materials like calling cards, original advertising, pamphlets, receipts, and building abstracts. In the past, the contents of these files were only available for perusal by visiting the Local History Archive in person, but Archive volunteers have embarked on a scanning project to put the key contents of some of the most popular vertical files online. Please note that these online resources are for educational use only and may not be duplicated or re-published. Check out our first foray into virtual vertical files with the “Auntie” Elizabeth Stone Collection. More files are being scanned for research purposes, including information on the Fort Collins Trolley, Annie the Railroad Dog, and the Virginia Dale Stage Station. Stay tuned for more online resources to make your journey into Fort Collins history easier than ever! And be sure to visit the Fort Collins History Connection to explore the research collections and exhibits already online. The Fort Collins History Connection is the ALA Digital Library of the Week! The Fort Collins History Connection website, an online collaboration between the Fort Collins Museum & Discovery Science Center and the Poudre River Public Library District, has been selected by the American Libraries Association as the Digital Library of the Week! Feel free to leave a comment on their site about our site! Oh, and if you haven’t been on the History Connection site yet, why not check it out today? A plethora of online, searchable resources about Fort Collins awaits you, including resources from the library, museum artifacts, and materials from the Local History Archive. Dig into history with photos, maps, oral histories, local anecdotes, and more! Fort Collins History Connection is LIVE! This project is the culmination of over two years of work between Poudre River Public Library District and the Fort Collins Museum & Discovery Science Center. After selecting and testing a new database product (CONTENTdm®), migrating data from the old database to the new one, adding the Museum artifacts information to the new system, creating new workflow procedures for staff and volunteers, and creating a new website (whew! ), we’re ready for you to enjoy! There is even a new name representing the collaboration between the Library and Museum – Fort Collins History Connection. There are lots of new features to explore! Zoom in on maps, view scanned city directories, or browse the Native American collection in the Museum Artifacts area. Also try using the search box to uncover a myriad of historical resources.